“My Family, My Friends, My Life,” traces Rita Lulay Malsch’s 72-year journey from 1944 to the present day. The author, Isabell von der Waldesruh, opens the story in post-war Germany with Rita’s family, who is struggling with their father’s untimely demise. Many of the details center around the rural German town of Heppenheim, a village that has existed since the Middle Ages. The author’s writing conveys a memoir quality in that it provides short descriptions from Rita’s early childhood to her present day existence. The composition, told by Rita, is like that of a child reciting information at “show & tell.” You can almost hear the subject’s German accent in the short sentence constructions. This does lend the tale an authentic quality since you truly feel as if Rita herself is reading to you. However, the story has little framework. It consists of paragraphs of sporadic subjects which tell of observations and occurrences. But there is little association between paragraphs. Some of the sections are labeled by historical events that have no direct relationship to the content (although they do provide the reader with a concrete timeline). Since no significant thread of action takes place, the sense of connection is lost. The construct of this biography is assembled in “snippets” of memories rather than a storyline. It reminds me of a scrapbook filled with assorted photos, recipes, song lyrics and travel logs. Despite the jarring change in subject matter throughout the biography, there are consistent themes and details that draw you back now and then. These often revolve around Rita’s health issues, her religious training, and the records of family births, deaths and transitions. Not to mention, the particulars of rural post-war Germany which may be educational for someone who is seeking material from that part of history. In addition, I enjoyed the details involving the textures, tastes, and smells of Rita’s experiences. When the author describes the spring cowslip flower as smelling “like a fresh apricot,” it reminds me of my own childhood growing up with a European grandmother. Rita’s mother filled her home with the colors and scents of lilacs, lilies and jasmine. I could relate to these as symbols of warmth and happiness. Waldesruh’s biography of Rita Lulay Malsch is one woman’s story of struggle and transition. It has interesting anecdotes of a life that began simply but quickly filled with difficulties. 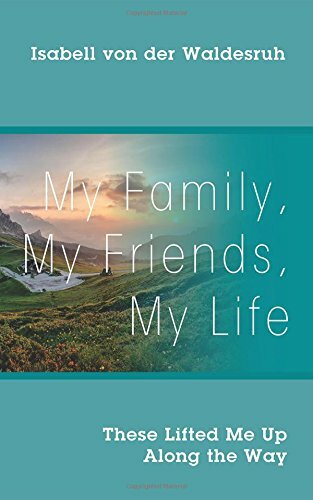 I would recommend “My Family, My Friends, My Life” by Isabell von der Waldesruh for people that are struggling with seizure disorders as it frames the strain this places on a family and normal living. Despite the unusual circumstances with which Rita is faced, she is a woman who remains strong and determined to fight for a joyful existence.